What are internal consulting skills? What is internal consultancy? 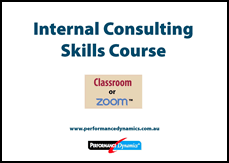 Performance Dynamics presents the leading internal consulting skills training course in Australia, New Zealand, UK and Asia. If you need to build relationships with people in your organisation, understand their business needs and wants, present business solutions, influence them and build their ownership and commitment to take action, then you are operating in an internal consulting role. This course (see internal consulting skills course program) is a fast-paced and highly concentrated learning experience and draws on the extensive practical consultancy and change management experience of the course leaders. The program includes internal consulting case studies, simulations, role plays and practical hints, tools and techniques to help you get even better results as an internal or external consultant. Designed to help you develop the practical skills required in a consulting role: in the practical case study simulation you will work in a team of up to 8 participants. Guided by one of our experienced facilitators you and your team will plan and take part in a lively and realistic simulation of a consulting assignment - from initial contact with the client through to a successful implementation. 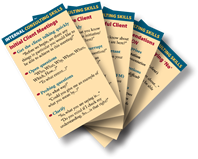 You will learn how to deal with the real-life hurdles internal consultants face and how to use many professional consulting tools and techniques. In the seminar presentations, discussions and practice exercises you will discover how to deal with difficult situations, influence difficult clients, build highly productive working relationships and re-position your work group as an "added-value" business partner. You will benefit if you are: a Human Resource practitioner, IT Professional, Business Analyst, OD specialist, Training practitioner, Learning & Development specialist, Internal Auditor, Finance & Tax specialist, Total Quality specialist, OH&S professional, Project Leader, Business Development Manager, Change Agent, BPR specialist etc. 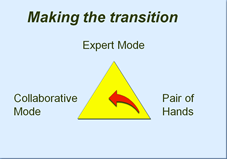 In fact any role where you need to get things done in parts of the organisation where you have no direct authority, or achieve objectives in situations where you cannot simply tell them what to do. Why attend one of our internal consulting courses? HR consultants:as a human resources specialist this course will boost your HR consulting skills and help you become more effective as an HR consultant and Business Partner. Learn how to get line managers to take ownership of the initiatives driven traditionally by a central human resources function. This is an adjunct to traditional HR training and HR courses. Human resources training courses provide a good foundation of technical skills and knowledge but often do not equip you with the HR consulting skills needed to move into an external HR consultancy firm or internal Human Resources business partner and consulting role. Our highly experienced course facilitators have many years' personal experience in HR consultancy and can bring to this course hints, tips and techniques that really work. IT consultants: as an IT specialist this course will boost your Information Technology consulting skills and help you become more effective as an IT consultant. Learn how to probe beneath the "wants" of clients to tease out the real business needs so that technology solutions are highly focused on the priorities of the business. This is an adjunct to IT training and IT courses such as business analyst training. Information technology training and business analyst courses provide a good foundation of technical knowledge and skills but often do not equip IT consultants with the IT consulting skills needed to move into an internal or external IT consultancy role. Our highly experienced course facilitators have many years' personal experience in IT consultancy and can bring to this course hints, tips and techniques that really work. 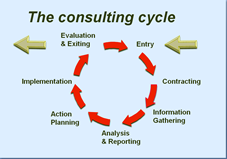 For more information get our short Acrobat "Internal Consulting Skills" presentation.